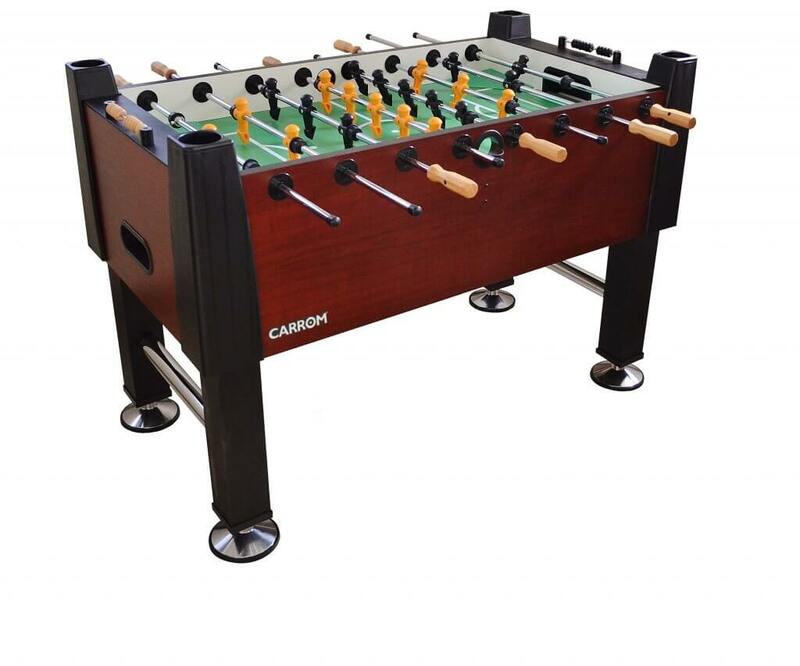 The Carrom Signature Foosball Table is a fantastic table, and we actually rank it #6 overall in our list of the best tables. We actually call it the best mid-tier foosball table you can buy. This is for a variety of reasons, which we’ll get into a bit more below, but primarily is because it’s a good, sturdy table, has good features, and doesn’t cost as much as some comparable tables. Not only is this one of the Best Foosball Table Brands on the market, but there are reasons for it to be a clear winner in this category. The cabinet is made of 1 inch thick particle board with a nice laminate on top. This gives it the strength and durability you need to play a fairly good game of foosball. The playing surface is only 3/8 of an inch thick, which is a bit on the thin side, but overall the construction of this table is good and allows for a good, fast game for beginners and pros alike. The legs are thick, the leg levelers are thick for great stability, and the cross supports between the legs are good for this as well. It’ll last a fairly long time with regular upkeep, just be sure not to be too hard on the actual playing surface itself. When playing foosball, the last thing you want or need is to have the table wobbling. This is why the Carrom Signature Foosball Table comes with 2-inch leg supports as well as the legs have miter fold heavy black vinyl. The leg levelers ensure accurate as well as easy leveling and this is aesthetically pleasing as it comes in triple chrome plating. As noted the playing surface isn’t that thick at only 3/8″. It has graphics which are screen printed on it and it has an enamel coat so that it resists wear and tear, which is a nice bonus for a thin surface. There are some nice scoring beads on either end. The ball return is on each end as well, which is not ideal, since you’ll have to walk over to the end every time someone scores. But, it has cup holders in each one of the the corners on top of the legs, which is a nice feature. In order to have better, faster and smoother spin action, there are premium bearings to get the rods moving well. The table comes with 2 different sets of players. One is a classic yellow and black, the other is a set that is done up to look like mini soccer players in blue or red jerseys. The yellow and black ones are counterbalanced for serious players, and helped us decide to rank this table so highly. The other painted ones might be better for casual fun play though. During setup you can choose whether to use a one or three goalie configuration. There are hollow rods of steel which are chrome plated and 5/8 in diameter. This ensures the shine is never diminished, but that they move quickly and don’t bend easily. They’re pretty standard. The handles are eight sided and made of hard wood. As our #6 choice for best overall table, you can’t really go wrong. If you want a good, mid-tier, US-made table that is fairly heavy duty and good for most players, then the Carrom is a fantastic choice.